Microphthalmia is characterized by an incomplete or unusually small development of one or both eyes. A genetic variant that causes a prenatal vitamin A deficiency can be responsible for the onset of the disease. Affected puppies only develop symptoms of microphthalmia, if their dam is affected by this disease, too. The disrupted transfer of vitamin A begins in the hepatic store of the mother and continues at the placenta. 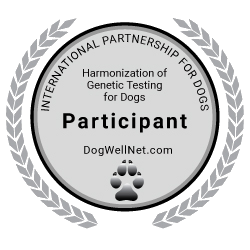 The puppies will most likely show no symptoms, if their dam is heterozygous for the genetic variant. Therefore, the maternal genotype influences the inheritance of the disease besides the autosomal recessive trait of this genetic variant.